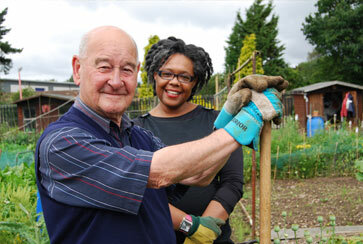 Helen’s Bay Community Garden in Northern Ireland helps local people to connect and grow. It is also an excellent example of how a group can generate income and support through engaging with businesses’ Corporate Social Responsibility programmes. The garden, which provides growing space for people from Bangor and Belfast, as well as the Helen’s Bay area, has run a number of CSR days involving hundreds of volunteers, including teams from Liberty IT and Lloyds. Available to download is a brochure designed by Helen’s Bay Community Garden, which they use, along with social media, to raise their profile and attract potential corporate volunteers.